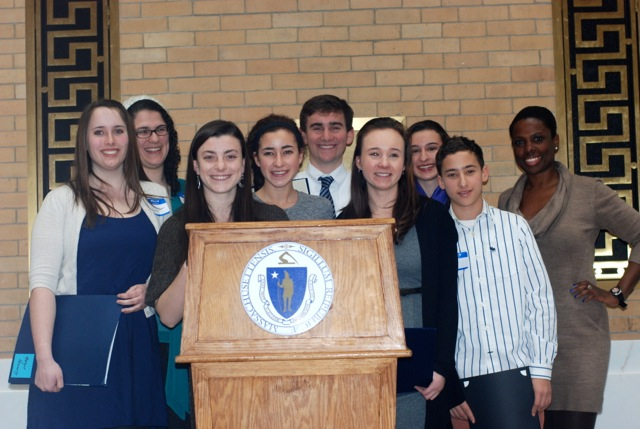 Teens recognized at Massachusetts State House with award for leadership in suicide prevention | Adolescent Wellness, Inc. In an event at the State House on February 11, the Massachusetts Coalition for Suicide Prevention presented its 2013 MCSP ‘Leadership in Suicide Prevention Award’ to iGROW (Interfaith Gathering ‘Round Our Wellness) and the teens who teach healthy 13 & 14 year olds to stay healthy by practicing resilience-building activities. Photo from the Massachusetts State House event recognizing teen leaders in suicide prevention from Dedham high school, the Winsor school, Dana Hall school and Wellesley high school. From left: Margot Manning, Rachel Barkowitz, Cecilia Milano, Olivia Stein, Bennett Capozzi, Alyssa Dole, Ashley Freeman, and Noah Stein. Next to Noah is psychologist Vanessa Prosper, Ph.D., of Boston Children’s Hospital. Participating teens not pictured: Alex Blakelock, Sarah Bradach, Tessie Connors, and Hannah Horobin. Eight high school age teens accepted the award for iGROW, a program which clergy and Boston Children’s Hospital co-founded with Adolescent Wellness, Inc. The teens teach the depression prevention curriculum through a three-part workshop series in the town of Wellesley, where eight youth have been lost to suicide in a ten year period. The curriculum, Break Free From Depression, is listed in the national Best Practices Registry of the Suicide Prevention Resource Center.